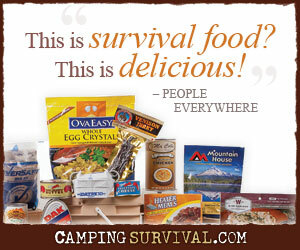 Our posts on PreppingToSurvive have generally been designed to help family, friends, and others prepare to survive unpleasant events. The events could be very personal (as in the loss of a job) or much broader (as in a natural disaster that affects a large geographical area). Often the posts are designed to help you think about preparing for the end of the world as we know (TEOTWAWKI). Recently, I’ve been reading The Bear Ridge Trading Post. Although it’s more or less just an online diary of the author’s activities, I’ve enjoyed following along and even learning from his daily experiences. I think there is value in that, in learning from another’s experiences. So, we’re going to begin a new type of post that will detail our family’s prepping adventure. We’ll post things that we do to prepare our family for bad times. We’ll include items that may not have been worthy of a full post by in itself, but as part of a larger picture they’ll hopefully be insightful or inspiring. We’ll continue with the traditional daily posts, but we’ll also have posts about our specific adventures so you can take the journey with us. Since it’s a national holiday in the U.S., we slept in. It was good to do that since I’ve been feeling a bit sleep deprived after camping last weekend. Started the day off with a breakfast casserole made in a dutch oven. Eggs, cheese, turkey pastrami and some milk. Very good! I cheated a little bit since I cooked it inside a regular oven. But that’s ok. It was still good practice and I know how to do it with charcoal. Got the recipe out of The Scout’s Outdoor Cookbook. Good book; I’ll write a review of it sometime. After the late breakfast we put together a rabbit hutch. We bought it from a lady who had listed it on CraigsList. They had used it to keep adorable and well-loved pet rabbits. I didn’t tell her that we’ll use it to keep meat rabbits. Our own version of Don’t Ask, Don’t Tell. Later I hauled off the trash. It’s easy to do that now since the trash drop off station is 3 miles from our home. But when and if TEOTWAWKI ever happens, we’ll need to figure out how to deal with our trash. Much of it is already repurposed – combustibles are used to start fires in the pot-bellied stove, left over food is fed to animals, some things are composted, etc. When TEOTWAWKI happens, there will be much less trash but we’ll still need to deal with it. Something to think about. Repaired a short segment of the pasture fence where a small limb from a nearby oak tree had fallen across it. Not a lot of damage, but still it needed to be fixed. Spent about an hour splitting firewood with a maul. My oldest son helped. It’s good exercise. Having a gas operated splitter would be a good investment in terms of cutting down the amount of time it takes, but there’s something refreshing about manual labor. It just feels good. Came in to rest before dinner and watched an episode of Man, Woman, Wild that I’d recorded. Laura prepared a meal for some friends who have experienced a loss. Our hearts break for them and they are in our prayers. About to go to bed and read some more “Lucifer’s Hammer“. Good night, all. I like your idea of a diary. i will check out Bear Ridge. Keep up the good work. Thanks, Rob! Do check out Bear Ridge. He’s gone completely off-grid and lives on very little. Ha! I noticed that on the first day of our Prepping Diary, I put the wrong date in! Oh well.